For hours he wandered through the city streets. Taking in all the sounds and smells that were more wonderful than any old warm bowl of milk. He’d even found a real mouse to chase, though it got away. 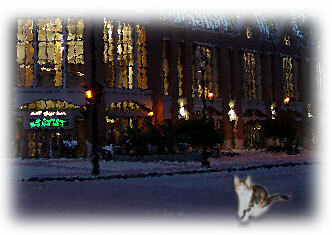 As the sun began to set and shadows fell over every street, Pouncer began to tremble. He turned down one street and then another. All of the buildings looked the same. As it grew darker, Pouncer felt more and more afraid. He suddenly wanted his Mother, but he didn’t know which way to go to find her. He darted across the street as fast moving cars whooshed by. “Oh, I shouldn’t have run away,” Pouncer cried as he scurried down an alley only to find another dead end. He missed his Mother. His missed Madam. He even missed his little sisters. He was alone and frightened. Suddenly he realized he was lost. Alone in the dark and shadowy alley, he began to cry. Pouncer looked up to see a big, fat black and white cat with a wicked little grin standing above him. He crouched down real low and scurried into the shadows until he found himself cornered in a box. The big alley cat pranced back and forth in front of the old cardboard box as Pouncer huddled deep within. “Please don’t hurt me, Mr. Alley Cat,” he whimpered.